This entry was posted in History, Infantry Combat, Movie, War Movie, WWII and tagged Attack and Retreat, Eastern Front, Giuseppe de Santis, History, Infantry Combat, Italian war movie, Italiani Brava Gente, Movies, Operation Little Saturn, Peter Falk, War Movies, WWII. This movie sounds intriguing and I would like to see it someday. There seem to be far more Italian war movies as I found out meanwhile. I did a search on Italian sites and there were loads. I’ll have to have proper look. I think this one might be worth watching. I had a feeling they did a lot of running on the Eastern front. Back home that is. Who can blame them? The Italian people were far less fascist than the German people were Nazis. It’s more about wanting to forget to have been of the wrong side than “not wanting to relive a pitiful performance” when an army is badly equipped and led. And there are more WWII Italian Army films, though not many. They include “El Alamein – The Line of Fire” (which is very good IMO), “The battle of El Alamein”, “The War is Over”, “Phantoms of the Sea”, “Heroic Charge”, “Hell Raiders of the Deep”, “The Patrol of Amba Alagi”, and others. Thank you for your movie recommendations, Tonio. I’ve watched and reviewed El Alamein, which I liked a lot. It is so depressing how many movies are deteriorating. As a history person and a movie lover, it breaks my heart. You mean the bad quality, right? Yes, I agree, one can hardly watch this. But some of the remstered movies look quite good. The problem is, if nobody wants to watch it, they will not do it. This is very late but I ran across your page as I was looking for information on the movie. I saw this as a kid in either the late 60s or early 70s. I remember it as being riveting and unlike anything I’d ever seen before. It was the first movie I’d seen that portrayed war as bleak and ugly, without any of the glory that I was used to with the typical fare on TV and at the theater. There are images that are seared into my brain and for years I’ve wondered what the title was so I could find it again. Well I finally did figure it out through googling and the one scene that was so effective is mentioned in the description. It is on youtube now but without English subtitles. Of course I would rather see it as a good print but I’ll be happy if I can just find a copy with subs. I live outside the US so I don’t have the typical netflix options. Thanks a lot for your comment. I should really make an effort and try to watch it. People who saw it, always think very highly of it. Seeing it in a cinema must have enhanced the experience, not like watching it on YouTube. From what I saw so far, it loks very grainy, very far from the usuall glossy looking war movies. I’m afraid that excatly this quality would be lost in a remake. I’m not sure whether there is a huge difference between the dubbed and the Italian version but I could imagine. Subtitles on older Italian and French movies are mostly quite shabby too. I hope you can find it somehow. Yes, I guess we’ll have to wait, or watch out for screenings at a Film Library near you. The Italian version on youtube is from the TV/VHS short edit, and so is the US DVD. Mosfilm, the Russian co-producer, has a much better quality transfer of the long version (you can see that on youtube also, as well as on mosfilm.ru) but it is over-dubbed in, well, Russian. I saw this movie in Paris in the mid 60’s under the title Le Bataillon Perdu. I was moved by the film’s story line and images. In the mid 80’s I wanted to find the film and eventually located a vhs version under the title Attack and Retreat through a business called Hollywood’s Attic. Interest in this film is well founded. It stands out both filmically and as a stark condemnation of facism. Thanks for this comment, Kevan. I’ve still not seen it but I wan t to. Even more now that I saw your comment. I think there’s a version on YouTube. Thanks for this comment, Kevan. I’ve still not watched it but your comment makes me want to. I think there’s a version on YouTube. I was lucky enough to see this movie, Italiani Brava Gente, screened at Middlebury College in the early 1990’s when Giuseppe De Santis was in residence at the Italian School. It made an indelible impression on me even though I’ve only seen it once. 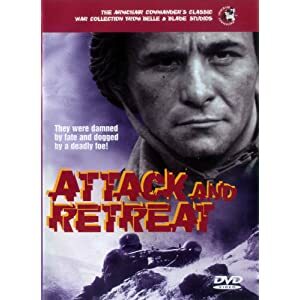 I have not seen the English version, Attack and Retreat, but I think it would be worth watching in the original Italian with English subtitles. Thanks for your comment, Elizabeth. I had almost forgotten about this. I’m glad to hear you liked it. I would want to watch it with subtitles. And I really should watch it.